Powerful tornadoes that swept across southern Oklahoma killed at least two people Monday, officials said. Bud Ramming, the emergency director in Garvin County, said a man believed to be in his late 70s was found dead in a home. NBC affiliate KFOR-TV in Oklahoma City first reported the death. And Johnston County Sheriff's Sgt. Stacey Pulley said a man died near the town of Connerville. Video from KFOR showed the storm producing a tornado that touched down near Wynnewood, as forecasters warned the storm and associated tornadoes may inflict "catastrophic damage." Some of Monday's weather was so bad forecasters declared a "tornado emergency" for the towns of Roff and Hickory, which were in the path of a storm. A radio station in Coal County received major damage, according to the Oklahoma Department of Emergency Management. "You are in a life-threatening situation," forecasters said when they declared a tornado emergency for Roff, population 725, and Hickory, population 71. "Flying debris will be deadly to those caught without shelter." Television images showed several homes destroyed, multiple overturned vehicles and trees torn limb from limb. A roof lay near a hay barn after the first tornado reports from near Wynnewood along Interstate 35. The Oklahoma Highway Patrol closed five miles of the main roadway between Oklahoma City and Dallas as the storm approached. It opened about 15 minutes later. The rough weather wasn't limited to Oklahoma. 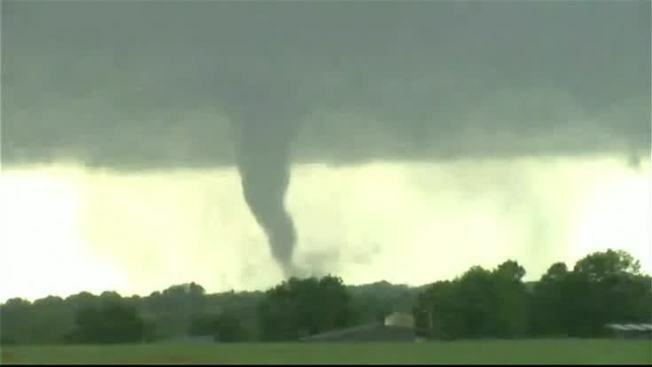 Cindy Fay, with the National Weather Service in Hastings, Nebraska, said there were three confirmed tornadoes that touched down Monday afternoon near the cities of Fairfield and Clay Center. The Storm Prediction Center had warned that a "substantial tornado risk" could develop Monday in portions of the Southern Plains and the Ozarks. The Oklahoma Highway Patrol closed a five-mile section of Interstate 35 between Oklahoma City and Dallas as the storm approached. Meteorologists said twisters with wind speeds above 111 mph were possible from eastern Oklahoma to central Arkansas. Hail 2 inches or more in diameter was possible from eastern Texas to southeastern Kansas. About 41 million people from Houston to Sioux City, Iowa, were at risk for some type of stormy weather. Video from KFOR showed the twister on the ground. The station reported before 5 p.m. that the tornado on the ground could be up to a half-mile wide. It also received reports of destroyed homes. Brittany McElhaney Flores captured video of the twister near Wynnewood and posted it to Instagram.